The 213th release on Greece’s Deepsessions Recordings is out this week and it features the debut of Russlan Jaafreh to the label. Russlan hails from Amman, Jordon and has been working on his progressive trance sound that has been inspired by DJs like Tiesto and Marcus Schossow. 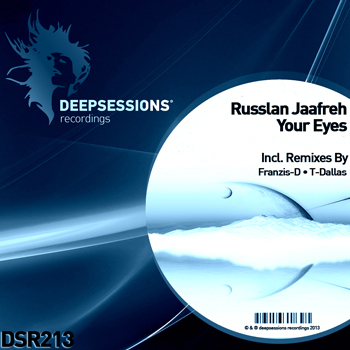 Russlan’s first single for Deepsessions is entitled “Your Eyes” which includes remixes from: Franzis-D and T-Dallas. The “Your Eyes” original gets the release underway with a smooth melodic vibe that carries some nice energy. The driving tempo combined with the harmonic subtleties makes for an all round classy sounding production from Russlan. The first remix comes from a Deepsessions veteran Franzis-D. The Spanish producer is making his 25th appearance on Deepsessions and once again delivers a great remix. Franzis has beefed the groove up with a massive kick and clattering percussion. The toughness though is evened out with the gorgeous melodic elements from the original about a third of the way in. The middle section of the record focuses on some wicked hooks which proves to be both incredibly infectious and also very housey. A definite dance floor winner from Franzis-D. The final remix on the package comes from T-Dallas who is making his 21st appearance on Deepsessions. The Greek producer was a staple remixer for Deepsessions all through 2011 and part of 2012 but he’s been a bit quieter of late but still had some great outings on LuPS and Mistique towards the end of 2012. T-Dallas” “Your Eyes” remix presents a dark , chunky groove throughout the record but the main break changes the mood entirely as the catchy melodic elements from the original are showcased nicely. Great pack from Deepsessions and a nice debut for Russlan Jaafreh.